3. Dara invites Emperor Shah Jahan, and his brothers to the underground chamber of his new haveli. Aurangzeb's distrust and jealousy come in the open. 4. Dara Shukoh presenting a carved railing for Keshva Rai Temple at Mathura. 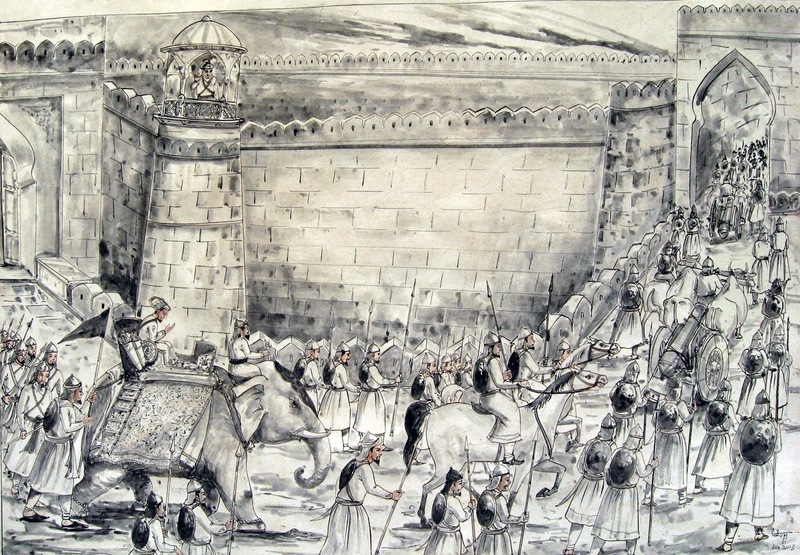 Later, Auranbzeb orders (1666 AD) demolition of the temple. 8. Dara Shukoh in conversation with Baba Lal (November 1653). 10. Shah Jahan confers the title of Shahzada-i-Buland Iqbal and special honours on Dara Shukoh (February 1655), Aurangzeb's indignation and hate for Dara heightens. 11. Prince Dara in conversation with a Hindu ascetic. "Aurangzeb in derision calls Dara a Kafir while Dara calls Aurangzeb a Namazi". 12. 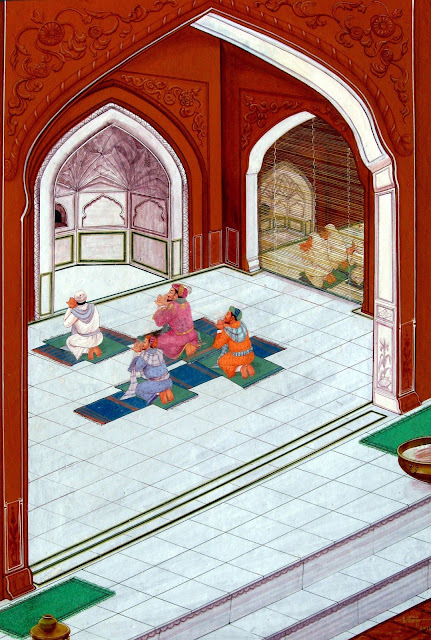 Dara Shukoh, his sons performing namaz in Red Fort mosque in Delhi. 14. 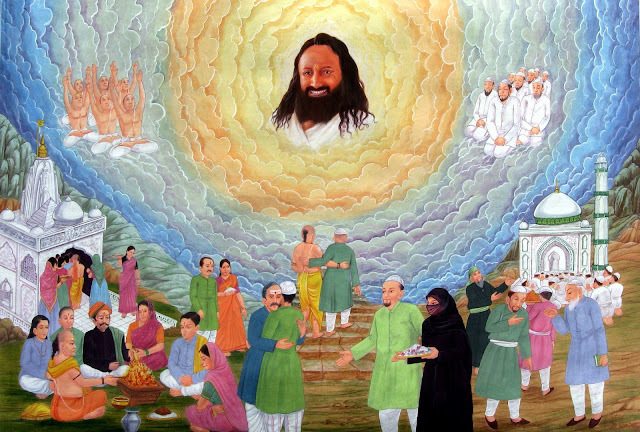 Dara Shukoh translating the Upanishads in the company of Pandits and Sanyasis (1657 AD). 15. Khalilullah Khan reading a secret letter from Aurangzeb. Betrays Dara Shukoh in the decisive battle of Samugarh (May 1658). 16. Dr. Bernier examining Nadira Banu's pulse. Fugitive Dara looks on (March 1659). 18. Emperor Auranbzeb examining the severed head of his elder brother, Dara Shukoh (30 August 1659). Roshanara Begum looks at her brother's head with curiosity. 19. Aurangzeb sends Dara Shukoh's head to their father, Shah Jahan, then in confinement in the Agra Fort (September 1659). 21. Dara Shukoh learning calligraphy from his teacher. 22. Dara Shukoh accompanied by Emperor Shah Jahan meets Miyan Mir for the first time (April 1634). 23. Dara Shukoh welcoming Sarmad (1654 AD). 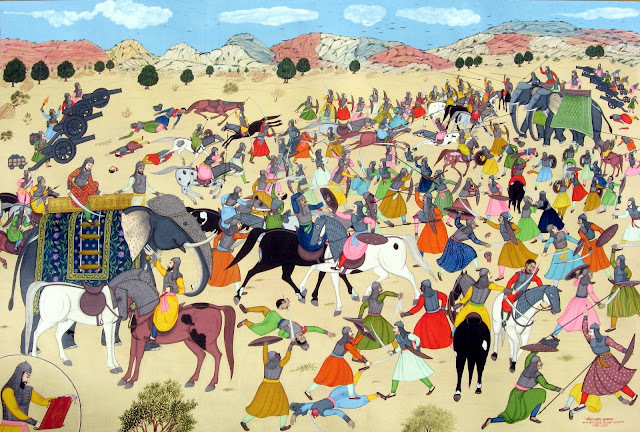 Later, Aurangzeb putting Sarmad to death on the charge of apostasy. 24. Dara Shukoh interceding to save Malik Jiwan's life. Malik Jiwan later betrays Dara Shukoh. 25. The Mewar envoys with Dara Shukoh seeking his mediation (October 1654). 27. Shah Jahan bidding Dara Shukoh adieu, never to see each other again (18th May 1658).